I’m still in Montreal and it’s cold and icy–but this is still one of my favourite cities. 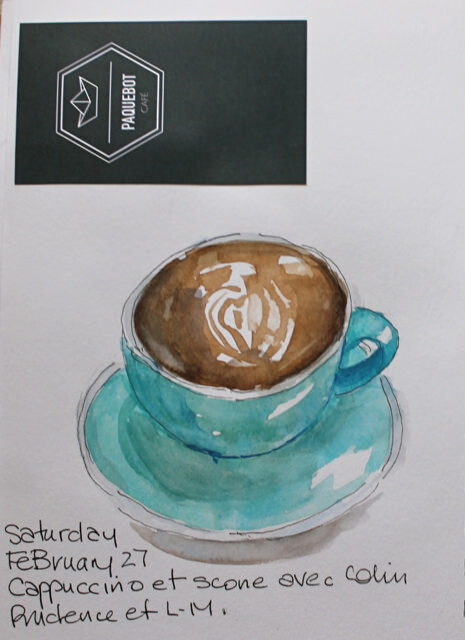 This morning we all went to a great spot, Paquebot, a coffee shop on Rue Belanger, close by my son’s house. It is such a treat to be in an independent café with a unique decor and a personal touch. 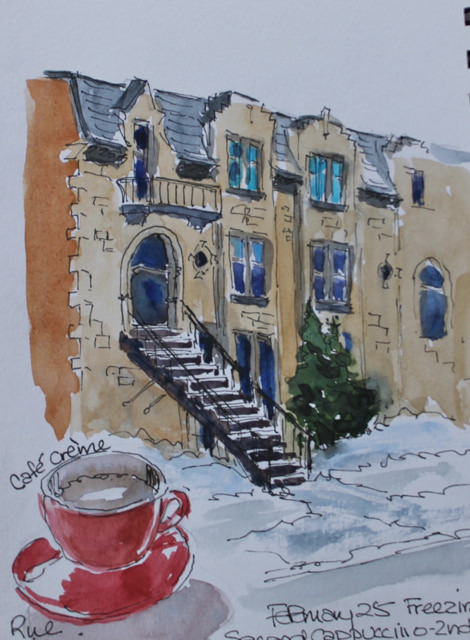 And a bonus for sketching–their china and much of their decor, are my favourite colour. 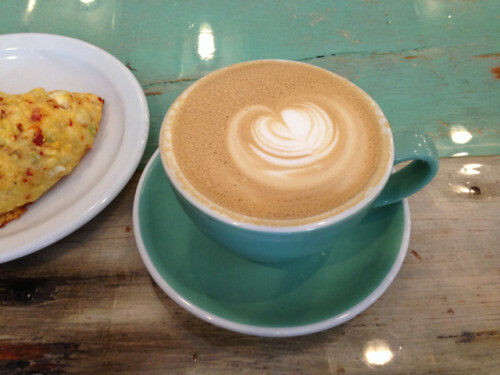 And — oh yes– the coffee and scones were delicious! 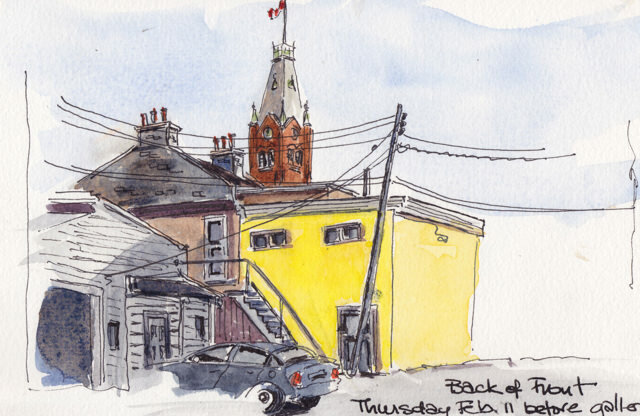 And here is a sketch from yesterday in Westmount. I was sitting in a café and sketched what I could see out the window. I stayed long enough to have two cappuccinos, the second one in a red cup! It’s far too cold and windy to sketch outside, so it’s great to find a café with a view of interesting buildings. I am enamoured with so many of Montreal’s turn-of-the-century structures. We are in Montreal staying for a week. We have a new family member! So admiring and cuddling are first on the agenda but there is also time to wander the city and do some sketches. It was a dark grey day yesterday, snowing hard, and then it turned to freezing rain, so most of this sketch was done back at the flat. 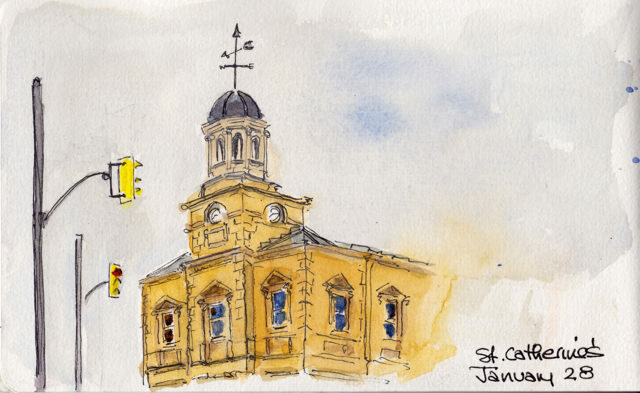 Tomorrow it promises sun, so looking forward to doing some sketches on site. And to heading on the subway to my favourite art store! Will keep you posted. 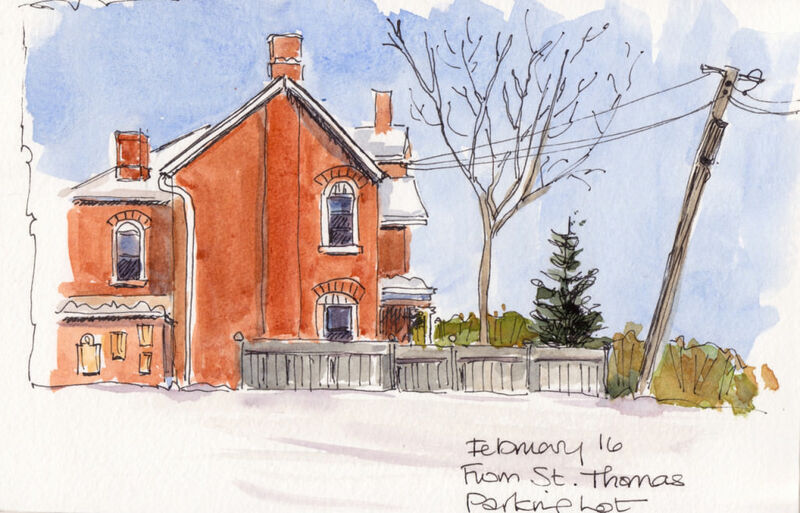 Meanwhile, this sketch from last week in Belleville was done in the full sun of a winter day. Those of you who are regular readers of this journal, will know I have long been in love with Marimekko, the Finnish design house. I purchased some of their coated cotton last spring and have begun now to make bags. 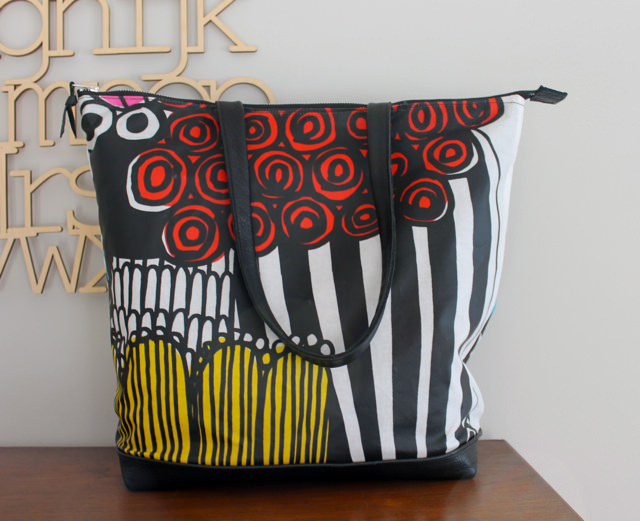 This print called Siirtolapuutarh, makes a stunning tote. This is the large size, 18″ x 14″ x 5″, with a strong metal zipper, and reinforced black leather bottom and carry straps. 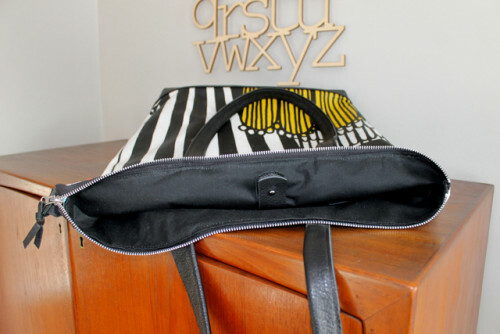 It is lined with black waxed canvas and has a special large pocket for your 15″ laptop which fastens with a silver knob closure (see the last photo). 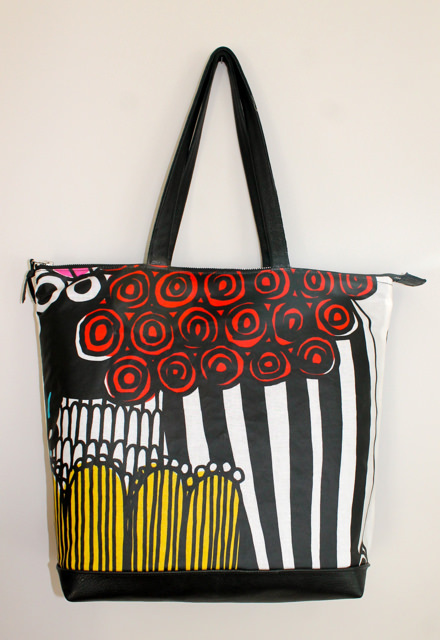 The tote also has a leather phone pocket and a large canvas slip pocket printed with birdbrain graphics. I have enough fabric in this design to make a couple of cross-body bags and two more totes. This one is currently in the online store. 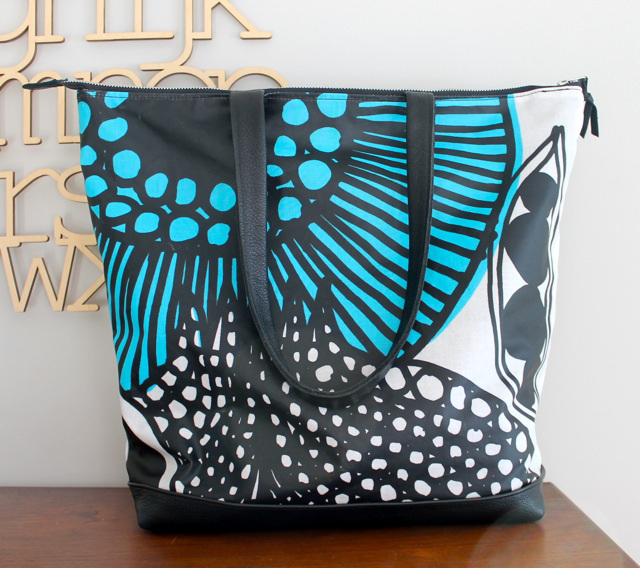 It would make colourful statement as a great weekend travel tote. It’s a milestone of sorts–joining the two ends of my rug. It is 5′ x 7′ and the end is in sight. As I look at the whole thing now, I see where I have to make some changes/tweaks but they will come at the end. I hadn’t worked out in the beginning how to morph from one colour to the next. 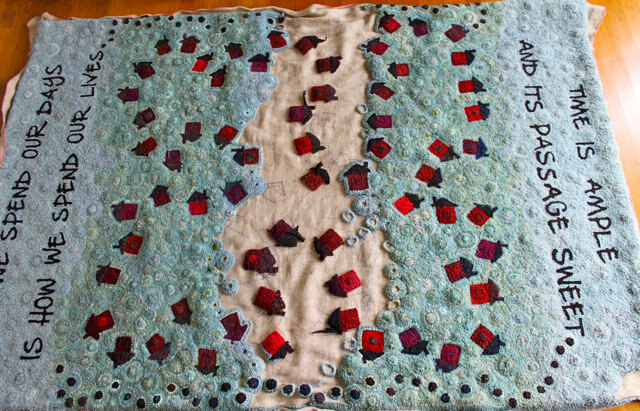 I’m sprinkling some turquoise, my favourite colour, into the middle now. It seems strange, after working so long on this piece how much joy I still get from forming each circle, from choosing the strands which make each one unique. I’ve spent much of this snowy week with the rug and good radio. A great winter combination. The Globe and Mail had another article this week on the benefits of knitting (substitute rug hooking, quilting, crocheting most handcrafted fibre arts). Stress reduction has been linked to such activities before. 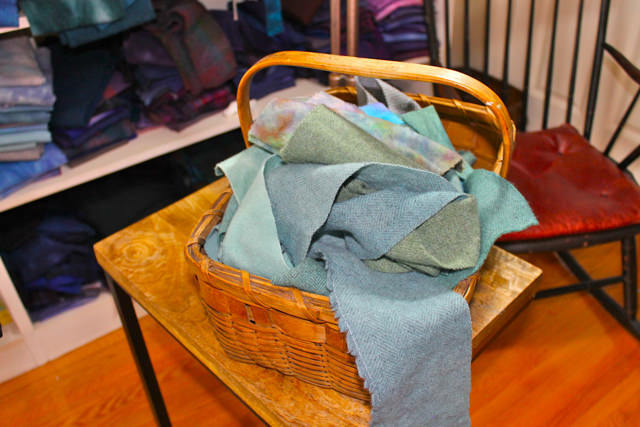 This article goes farther to suggest that such fibre handcrafts not only reduce stress and help avoid depression but “may help to stave off a decline in brain function with age”. Hurray for that. I’m all for staving off my brain decline. But mostly I’m about the love of strips of hand-dyed wool pulling through my fingers and sitting next to one another in lovely colours. And I love the feel of the finished product under foot and the look of it across a room. If the joy of creating one of these hand-hooked pieces also helps me keep a grip on things a little long…all the better. 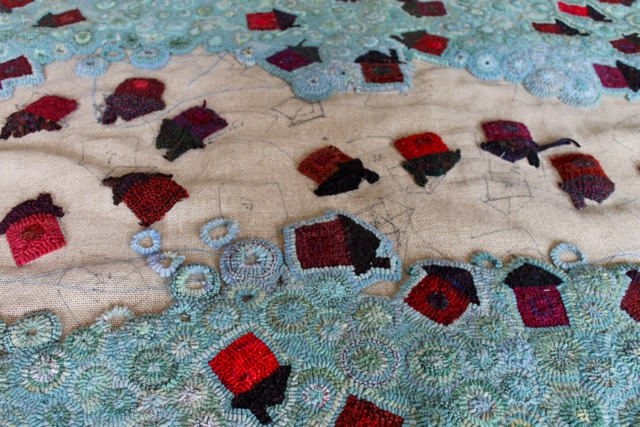 If you would like to see photographs of this rug in progress, just type Annie in the search box on the top right of the page. This cartoon depicts the life we have been experiencing in Eastern Ontario this week. Lots of snow and reasons to stay inside, only one of which is eating ice cream. 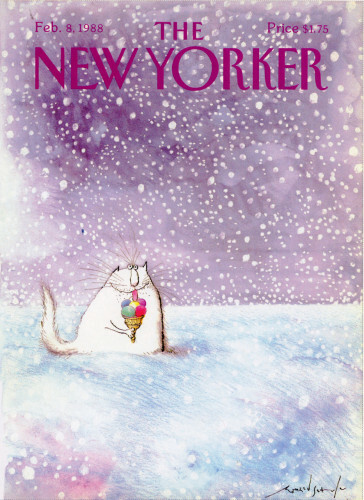 This 1988 NYer cover is by Ronald Searle. For me it has it all: charm, colour, design and wit. I hope you will read this Guardian obituary because it is full of fascinating details of Searle’s life and gives an insight into the sustaining power of sketching, even in some of the worst of life’s situations. 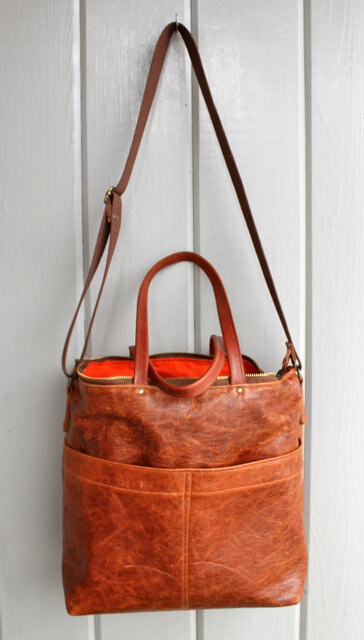 I finished a new leather tote, lined in orange waxed canvas with lots of pockets. 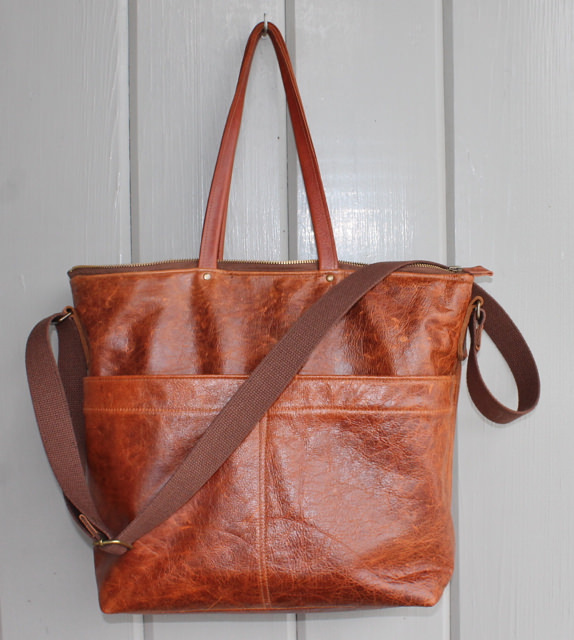 It is of made caramel coloured leather with a double leather bottom which carries up to make two deep front pockets. 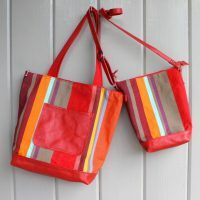 Inside there are more large pockets, made of easy-clean striped coated fabric. Carry handles and a cross-body strap give options when your hands are full. 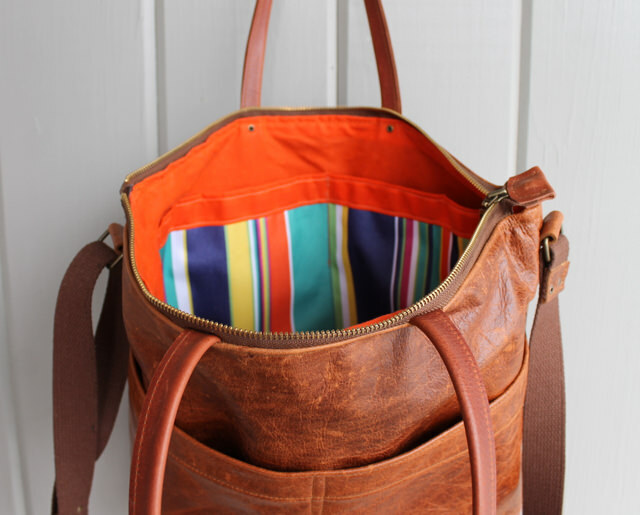 This tote looks good enough to go to a meeting, but would also make a great diaper bag with its roomy storage and easy-clean interior. Durable metal zipper and hardware. Width 17.5″, height 13.5 inches, depth 5″. It is -24C today outside my house and, with the windchill it feels like -33C. So that is very cold. And yet the winter sun is spectacular and casts such a lovely light on everything. I have not been here in February for five years and I am enjoying it very much. Each day gets a little longer as we creep towards spring. 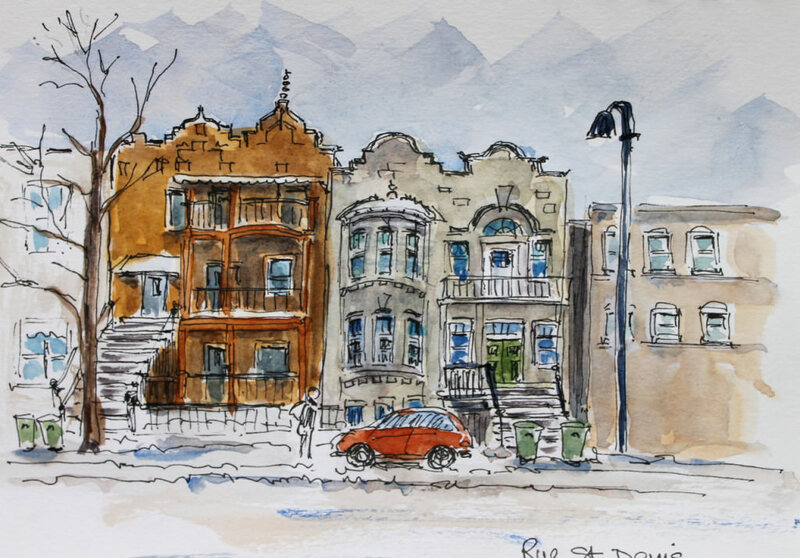 Below scenes on my street and downtown done in my 5″ x 8″ Pentalic sketchbook. Here are some random pages from my sketchbook. I have been thinking about windows and overall composition. 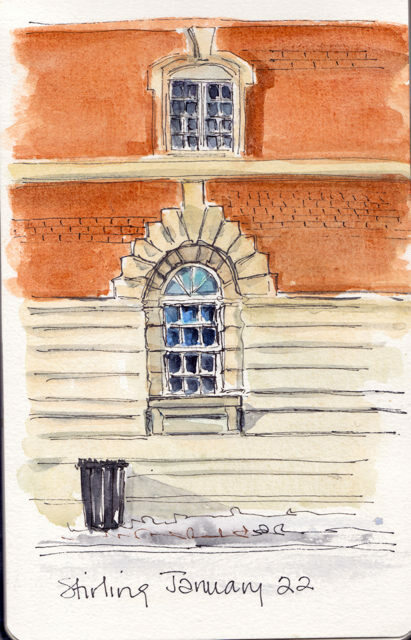 I love sketching buildings, but I often am so eager to get it right, the proportions etc., that I forget that it is about composition as much or more than it is about accuracy. In fact I am coming to realize that accuracy is less important than I thought. Anyway here are some pages of learning randomly taken from my Pentalic sketchbook which is nearly finished. Window pane experiment…sitting in a great café in Hamilton with my long-time friend, talking, drinking latte and fooling around with colour. 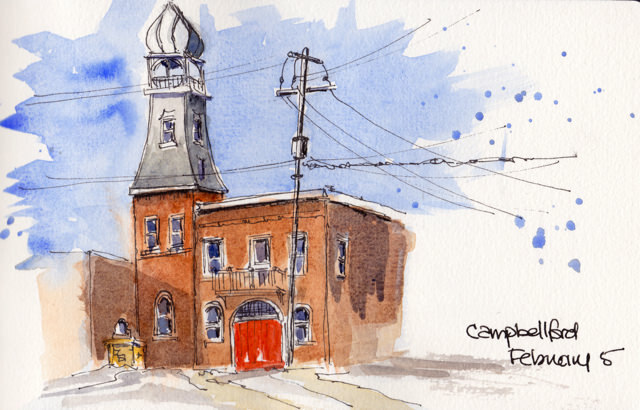 Last week I was in Campbellford on a beautiful sunny day. I’ve always loved this town on the Trent River and especially its fire hall which was built in 1889. 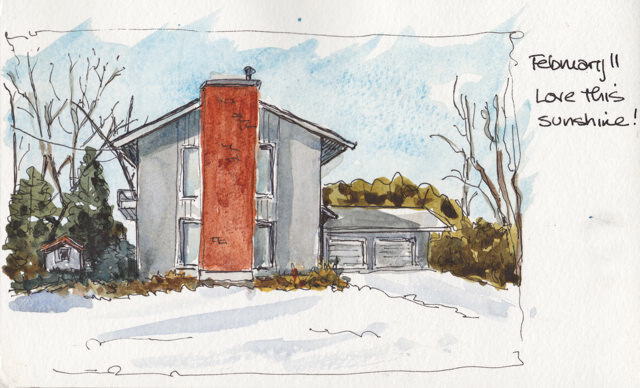 I found a parking spot just across from it and sketched it from my car. Before I left I drove over to check the date on the heritage plaque. I was surprised to learn that the fire station is still in active use, although the fire fighter I spoke to said a new station is being built and soon this may be a restaurant. I certainly hope they maintain the unique exterior–the tower and onion dome are wonderful. 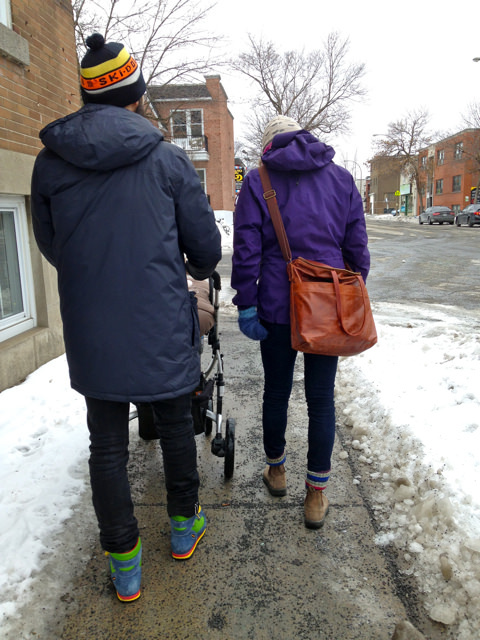 Prior to that I was in St. Catherine’s to visit the brick and mortar shop of two Canadian designers I like very much. 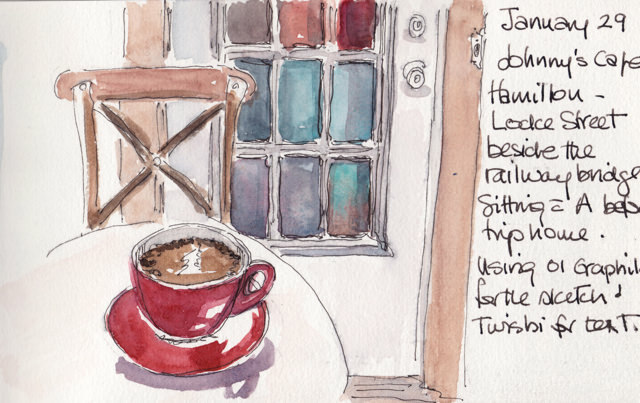 We had a great visit there and then went to a cafe for a quick sketch. As I’ve said here before, I try to buy handmade goods or great barely-used clothing (more on my favourite spot for that in another post). I really believe in supporting local designers whose work is of such good quality and who make great wearable designs. …and I think I am obsessed with small town towers. and windows…this is an incredible building in a small town near my house. I want to take the time soon to do more of it. In the meantime practising windows. 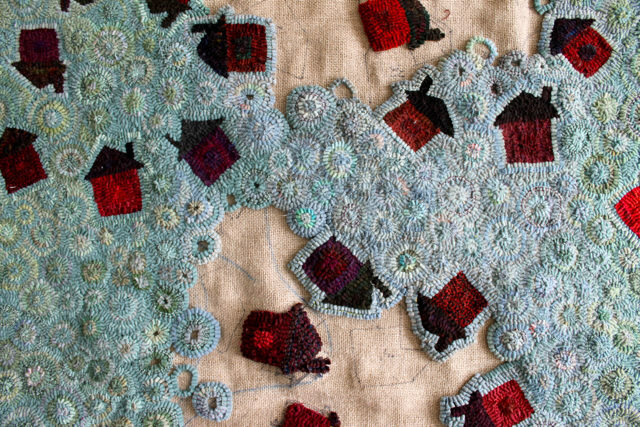 I’ve been spending some winter afternoons with Annie, and making some progress. 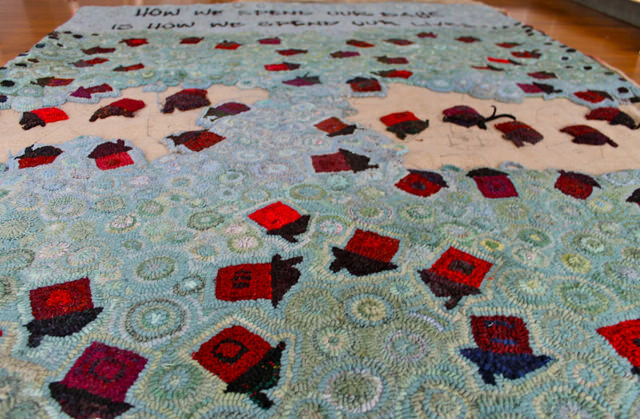 When I look back at the last post, the progress is not as dramatic as I had hoped…but this is a big rug and it’s good to celebrate even a bit of progress. The green section is done and I am back in the blue, the middle. This kind of circular hooking is fun for me, even in a piece this size. It is a game–each circle is different from the others, in size and texture, in colour combination. And I am getting tantalizingly close to joining the two parts–when I reach that point, I’ll post again. 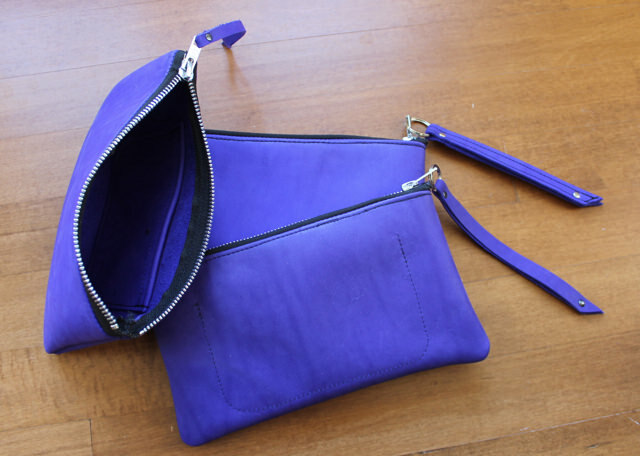 I had a remnant piece of this great cobalt nubuck, enough for about half a dozen pouches. 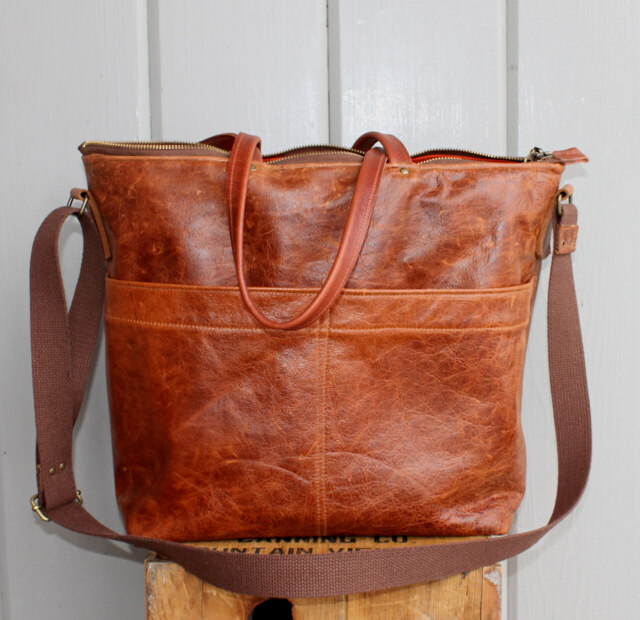 This leather has a beautiful rich colour and texture and makes great unlined pouches. 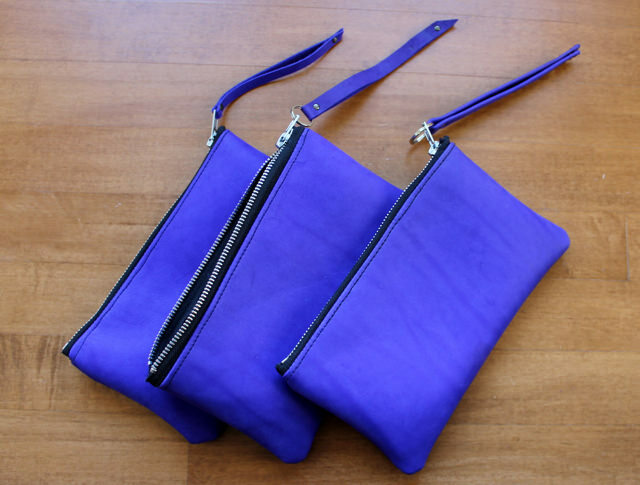 These three are 8.5″ x 5″ with sturdy metal zippers, a leather carry strap and an interior pocket for cards and cash. 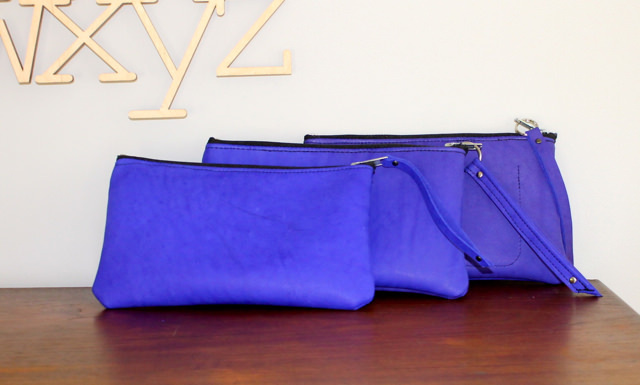 They are perfect for taking out on their own to carry your phone, money and keys, but will easily slip into a larger bag. Although with this outstanding colour, you won’t want to hide them! In the shop tomorrow.